Kate McWilliams is an airline Captain. One of only 500 female airline captains in the world. Her interest in flying started at an early age, gaining her first hands on experience aged 13. Six years later, on her 19th Birthday, Kate started at pilot training school and gained her commercial pilots licence. 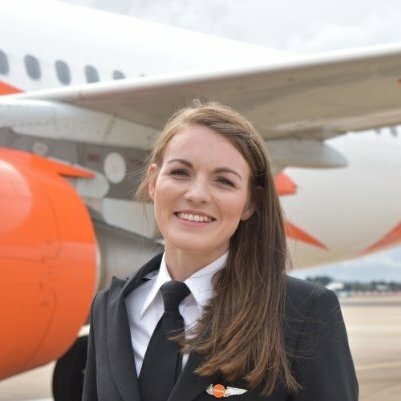 Aged just 21 Kate started working for easyJet as a First Officer gaining valuable flying hours and airline experience. In early 2016 aged just 26, Kate became the world’s youngest female commercial Captain. Since then Kate has linked up with many schools and youth organisations to inspire other youngsters to achieve their own childhood dreams. Her efforts were rewarded at the 2018 Every Woman awards where she was named Woman of the Year. Kate is now a Training Captain, training easyJet’s newest recruits. Please check you can watch the live stream for this event by clicking on the player below. For best results please use Google Chrome on a PC/Laptop or Safari/Firefox on a tablet device. You can also leave a question for the panel in advance by using the chat facility below next to the video player. What is a Gatwick Airport LIVE broadcast? Gatwick Airport LIVE is a live streamed event that will broadcast to thousands across the UK wanting to find out more about Gatwick Airport, the work done by Airfield Ops and the career of Kan Ni. How do I ask a question before or during the live broadcast? You can ask questions now or live on the day of the event by using the chat facility which is located next to the video player above.